Along with you attic and basement, the garage is one of the main places in your home prone to excessive clutter. When people can’t find a suitable spot for an item in their home, most of them will simply throw it in the garage. In fact, it’s been estimated that only 30 percent of garages are actually used for storing cars because there’s too much stuff inside them! Organizing the garage is a task found on many homeowners’ to-do lists, but it often gets skipped over because it feels like such a large, overwhelming project. We’re here to show you it doesn’t have to be! 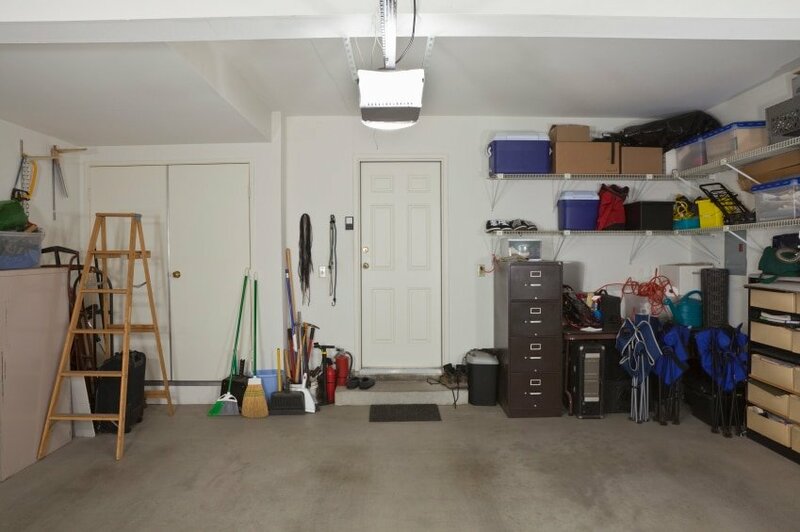 With a few simple pointers, you too can efficiently and effectively re-organize your garage. 1. First things first: establish your intention for the garage. Not everyone cleans out their garage to fit their car inside; some people would rather turn it into a workspace or just store their lawn care and athletic equipment more efficiently. What you intend to do with the space will affect how you organize it. 2. Clear out as many items as possible. It can be difficult to truly assess how much space you have if you can’t see all of it! Most people are pretty shocked at how much space they actually have once they’ve moved all their belongings out of the garage,. The garage can seem a lot smaller when every nook and corner is packed with clutter. Furthermore, a clean slate will help you examine the space better. Sometimes it’s hard to visualize a different set-up when everything is still where you’re accustomed to seeing it. You might also want to use this opportunity to clean and/or re-paint your garage if it needs it. This entire process can be rather labor-intensive, so you can make this a family project or ask neighbors to help. Keep (essentials and things you know you will use), Donate/Sell (things in good condition but that you don’t necessarily need anymore), and Throw Out. Try to be realistic about what things you do and do not need. The tendency to unnecessarily keep things you “might need one day” is often what leads to cramped, messy garages in the first place. 4. When moving items back into your garage, use your walls and ceilings to their fullest potential. Some people may see the garage floor as the biggest shelf in the room, but if you really want to free up space, use hanging organizers. You can actually mount most things onto the walls with storage racks/baskets and hooks. Sports equipment can be put on shelves or in raised cabinets and stackable bins. In addition, everything from bikes to shovels can be mounted on the wall. You can hang flat items like ladders and skis across the ceiling where they won’t interfere with anything else. Keeping the majority of your belongings off the floor prevents cluttered piles from growing. 5. Going forward, do your best to stick to your new system. Put items back where you found them instead of tossing them into a corner like you used to. After putting in this much effort to re-organizing, do you really want to do it all over again in a few months? Challenge yourself to make your new and improved set-up last. That being said, make an effort to spend a day or two each year re-evaluating your garage and which items can be sold, donated, or thrown away. Doing a little maintenance each year will keep the space from becoming overwhelmed with junk again. Enjoy your new, clean, and improved garage space!